When you’re playing golf either professionally or only for leisure, the last thing you want is outside elements ruining your game. The best thing to do is to purchase a handy umbrella to make your golf day more comfortable. Though it may seem unimportant to have an umbrella as part of your golfing equipment now, it’s actually an essential item at all times. When you’re spending long periods of time in the sun, it can be damaging to your skin, not to mention how uncomfortable it is. And of course, they can be as effective on rainy days. So what are the best umbrellas on the market for golfers at the moment? In this article we will give you the best ones to pick from. BAGAIL golf umbrellas have ergonomic designs perfect for any professional golfer. They’re exceptionally durable and effective as they’re made from 190T pongee micro-weave fabric that is waterproof & sunproof. It’s equipped with a slip resistant rubber handle for an easy and comfortable grip. These umbrellas come in a wide variety of designs. BAGAIL golf umbrellas protect you from the rays of the sun and they can withstand almost any weather conditions. They’re light in weight which makes them comfortable to carry. It has a solid yet flexible framework to withstand windy conditions and this keeps the umbrella’s shape. The ribs, hub and shaft are made from fiberglass which is an insulator, making it safe for you to walk in electric storms. 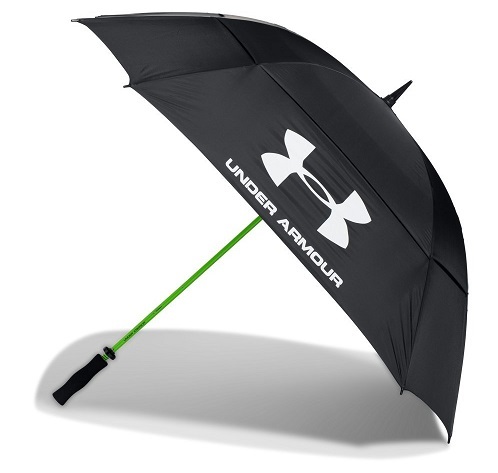 The Under Armour golf umbrella is perfect for leisure golf days in the sun. With its large 68″ canopy it can give shade to your entire body. The canopy is made with 100% nylon for durability and protection. This model has a fast dual action opening, so you’re able to enjoy your golf game and provide protection from the weather almost instantly. This umbrella has a textured rubber handle for a comfortable grip which is also slip resistant. The umbrella can provide shelter for you and your equipment when it starts raining. ACElken makes golf umbrellas of different sizes. You can select between 58”, 62” and 68″ canopies, which all come with the same ergonomic designs. The canopies come in a variety of colors and designs so you can pick one that suits your style. They’re also double canopy designs for extra coverage. These umbrellas operate automatically with one-push buttons to rapidly open your umbrella with one hand. ACElken uses 190T pongee micro-weave fabric which is weather resistant. The ribs, hub and shaft are made from fiberglass for extra protection against electric storms. 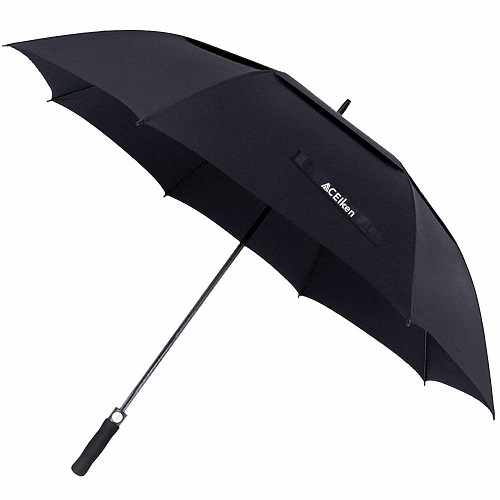 ACElken designs its umbrellas very light so it’s not harsh on your hand and wrist. 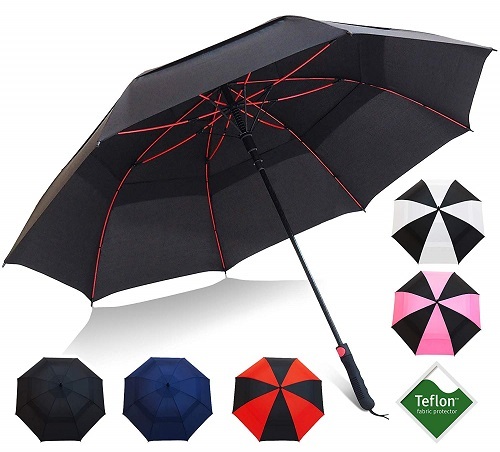 These umbrellas protect you through any weather conditions providing you with sufficient shade for hot or rainy days. Repel reinforces its umbrellas with fiberglass frames for durability and protection. The frames are made of three layers of eight ribs to ensure stability in the case of wind. Repel golf umbrellas have 60″ canopies that are double layered which prevents wind from inverting the umbrella. It’s made with a Teflon fabric which is water resistant and it repels snow, dust and various debris. These umbrellas have auto-open designs and they come with rubber handles for easy and comfortable gripping. 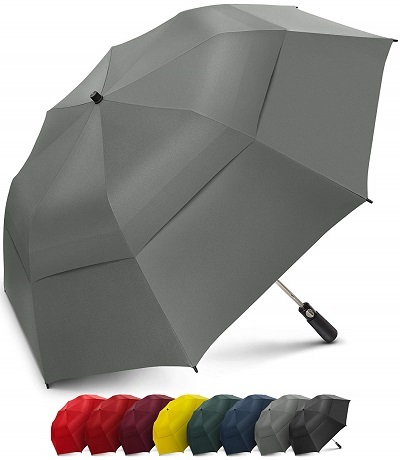 Repel makes the most durable and user-friendly umbrellas on the market. Although the canopies are large, the umbrellas are light in weight making them easy to walk around with for long periods of time. They come in many different colors so you’re easy to spot on the golf course, and they are thin enough when closed to fit into your golf bag. Amago automatic golf umbrellas come in a variety of inner designs so you can make a fashion statement. The canopy is 59″ wide providing you with sufficient coverage. Amago golf umbrellas are made from a durable 210T pongee fabric which is water resistant. This fabric is anti-ultraviolet which protects you from harsh sun rays. These golf umbrellas are convenient and extremely economical. They have unique designs to ensure stability and comfort when walking. 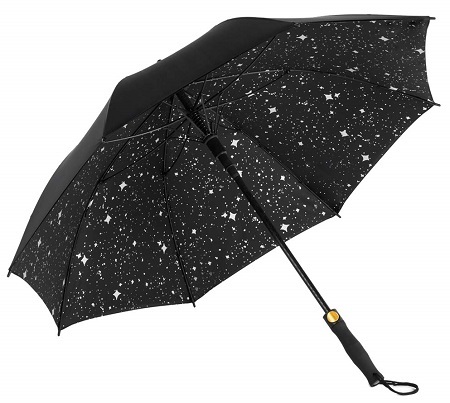 With its automatic feature you’re able to open your umbrella rapidly whenever you need to. 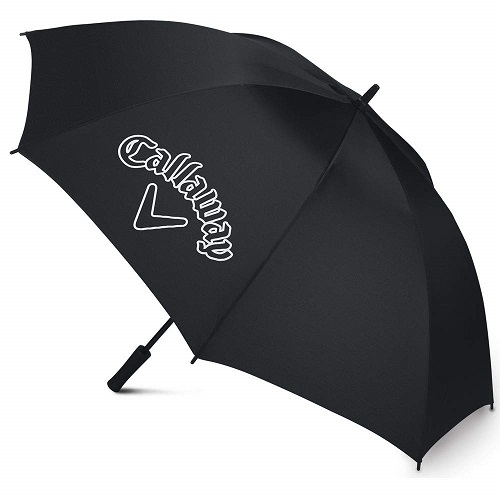 The Callaway umbrella is black made from nylon material. It’s a single canopy umbrella that is 60″ in diameter capable of providing sufficient coverage. This umbrella is made with a tension cable that prevents the canopy from inverting in windy weather. It’s made with a light fiberglass shaft which is an insulator for electric storms. Some may prefer the manual mechanism, which allows you to open and close the umbrella at the speed that suits you. The Callaway umbrella has an ergonomic design which provides comfort for those long walks on the golf course. It’s light in weight which makes it easy on the wrists and thanks to durability it will withstand almost any conditions. The EEZ-Y portable umbrella has a double canopy design which keeps the umbrella from inverting when it’s windy. It’s a 58″ canopy design capable of covering more than one person at a time. The canopy is made with a 210T fabric which is waterproof and UV resistant protecting you from any kind of weather conditions. It’s made with a unique design for sturdiness and durability. The EEZ-Y is foldable which converts it to 23″ in size. This helps with portability and storage & this is a light weight model. The shaft, ribs and hub are all made from fiberglass & stainless steel for protection against elements and for durability. 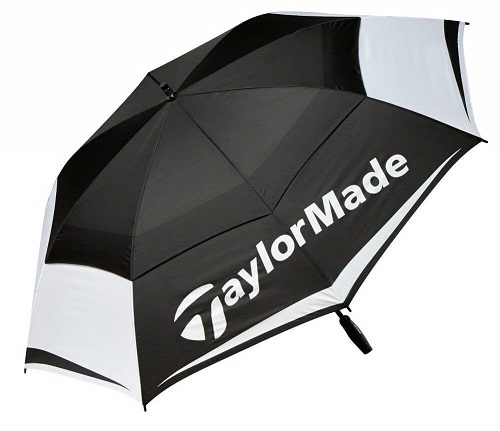 The TaylorMade umbrella has a 68″ canopy capable of maximum coverage. It also has a double canopy design to repel wind. This umbrella is made with a durable fiberglass frame which will even protect you if there’s lightning. The ribbing design can withstand hurricane-like weather so you know this is a quality option. The TaylorMade golf umbrella has an integrated gel handle that is slip resistant for easy grip and comfort. 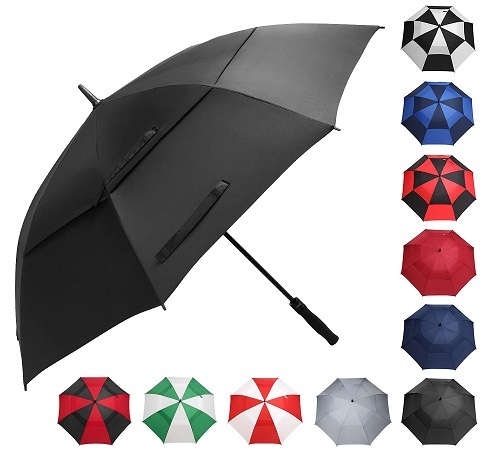 TaylorMade designs its umbrellas for simplicity and comfort. The brand uses quality material for shafts, ribbing and hubs which results in the robust design. They’re safe and easy for anyone to use as well as light in weight for easy portability. 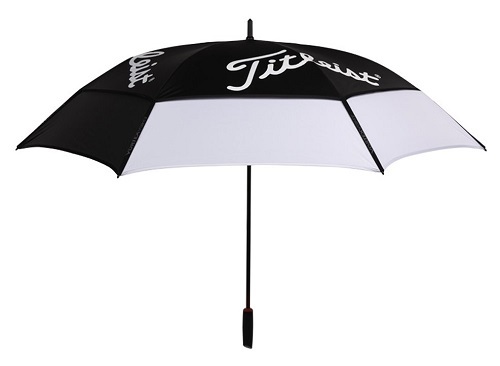 Titleist’s golf tour umbrella has a unique ribbing design that protects it against inversion. The canopy is made from UV treated material to protect you from harsh sun rays. It also provides a 68″ coverage so you’re able to provide shelter for a friend too. This model provides an efficient amount of protection and coverage from rain, sun rays and even the wind. Its ergonomic handle ensures comfort and easy grip. This umbrella is light in weight but just note it’s a manual device unlike some others on this list. Its bright color ensures you’re easy to spot on the golf course. 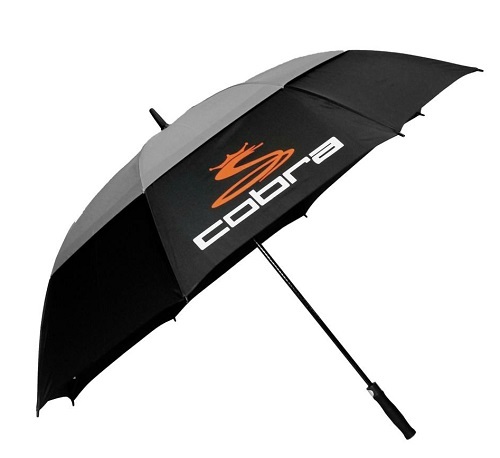 The Cobra golf umbrella has an automatic one-push button to ensure you’re covered almost instantly. This is essential if you want to keep your equipment safe from the rain. It also provides sufficient coverage as the canopy is 54″ in diameter. The canopy is made from 100% polyester for durability and protection from the elements. It has a molded plastic handle which is slip resistant for a sturdy grip. The Cobra golf umbrella is inexpensive yet still reliable and effective. It can provide you with the coverage you need from almost any weather conditions and even falling golf balls. Golf umbrellas are important components of any golfing kit. You should always have one handy for those long days on the course. Now that you have insight on the different types of umbrellas on the market, we recommend the Repel golf umbrella. This nifty umbrella is inexpensive yet it’s made with quality materials. It works not only for economic purposes but for safety measures as well. Your next day on the gold course can be much more enjoyable than your last. Which one will you pick?